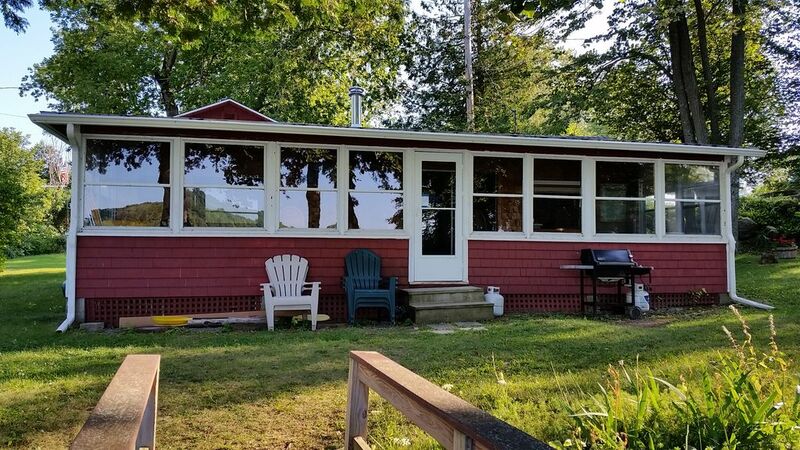 Rustic but comfortable circa 1933 lakefront cottage in the Long Point community available for weekly rentals and long weekends (3-night minimum) from May through October. 2 bedrooms, 1 bath, kitchen, enclosed front porch overlooking the lake. Canoe and kayak available. 3-night minimum. The cottage is located just 30 minutes south of Burlington and just 30 miles north of Middlebury. Closer yet are the quintessential Vermont towns of Shelburne and Vergennes (15 minutes). Peaceful setting but convenient to a wide range of activities. Have breakfast at 3 Squares Cafe. Explore Shelburne Museum and Shelburne Farms. Hike Mount Philo and have a picnic on the top. Sample local wine at the Charlotte Village Winery or local beer at Fiddlehead Brewing Company. Canoe the Lake Champlain shoreline right from the cottage. Enjoy a perfect dinner at the Starry Night Cafe, Black Sheep Bistro or Antidote. We hope you enjoy the cottage as much as we do. If you tell us your interests, we are glad to suggest a list of activities to choose from during your stay. Please contact me with any questions you may have before booking. We are a family of four living in South Burlington, Vermont - just 15 miles north of the cottage. We all enjoy the outdoors - hiking, skiing, boating, biking, swimming, etc. - and the cottage is a great leaping-off point for all of those things! We love to share it with others who enjoy it as much as we do. We fell in love with the place as soon as we saw it. The view, the location, the charming shingled cottage, the wonderful Long Point neighborhood... It is an easy place to love! We've joked that we would have bought the place if it was just a front porch. It is such a perfect place to look out at the lake and enjoy time with friends and family. Bathroom has a shower, toilet, and sink with mirror. This area of Vermont (Champlain Valley) is a mix of picturesque farms, woods and rolling hills. Enjoy views of the lake, boats and wooded shoreline on the opposite side of the bay from the enclosed front porch. The cottage is located directly on a peaceful bay of Lake Champlain. Basic bed linens are provided. Nothing fancy, but clean! A couple of towels are provided for the bathroom. Please bring your own beach towels. There is an open living/kitchen area with two couches. Dining table on the front porch with 6 folding chairs. There is a portable radio/CD player. We have a collection of board games for your use. Small lawn area overlooking lake. Perfect for enjoying the view or playing lawn games like bocce. A canoe and kayak with paddles are provided. We have some life jackets, but please bring your own to ensure the best fit. Life jackets for each passenger are required by Vermont law. Please let us know if you would like to bring a boat. Depending on the time of year / lake level, we can sometimes accommodate boats at our dock. The Long Point Association has a clay tennis court within walking distance. Unfortunately, there are steps and narrow doorways that make the cottage inaccessible for wheelchairs. The cottage and surrounding area has something for everyone. Visit nearby Burlington and discover why it has made so many Top 10 lists. Hike Mt. Philo - just 5 miles away. Eat at the Starry Night Cafe, Antidote, Bearded Frog or other well-regarded local restaurants. Sample local beer at Fiddlehead Brewing Company and local wine at Charlotte Village Winery or Shelburne Vineyard. Are you a cyclist? The cottage is located just off the Champlain Bikeway. Like history? Visit the Shelburne Museum, Shelburne Farms, the historic town of Essex (NY), the Rokeby House, Lake Champlain Maritime Museum... all within 30 minutes. Drive a little further to visit the Revolutionary War sites of Crown Point and Fort Ticonderoga. Best of all, enjoy canoeing, kayaking and swimming from the front door! Very accommodating host. Beautiful views and centralized location was ideal for our needs. We had a great stay at Duncans place. The house was just the right size for our family of 4 and had everything we needed. Direct access to the water was wonderful. The canoe and kayaks were used just about every day and fishing along the rocks was a hit. You will find it easy to bounce between many of the small towns in the area and you're about 30 minutes from Burlington. Bartlett Falls was our favorite spot which is located just past the town of Bristol, great swimming holes on a hot day. So much to do and see in the area. We miss it already. Camp on a cove- great for a small family with small kids! We stayed at the camp for three weeks in July 2018. The owner was very attentive and accommodating. Great for little kids because the cove is shallow and sandy. We enjoyed the AC during a heatwave. great location and so much fun! we had perfect weather and a great stay. This cabin has everything you need. simple but perfectly equipped. we had a blast! AND the owner was super accomodating! This is one of approximately 125 cottages in the historic Long Point community - located on some of the most beautiful shoreline of Lake Champlain.